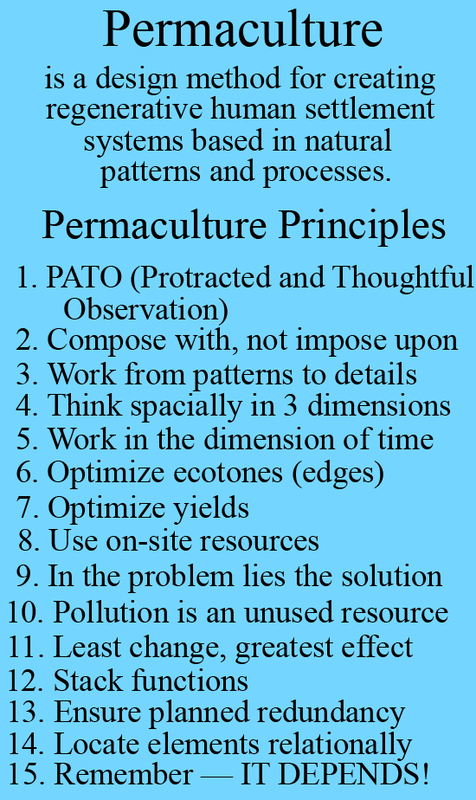 In permaculture design, stacking functions is a way of ensuring that whatever we do in life has multiple benefits. That’s a pretty broad statement, but if we narrow our focus to our back yard, for example, planting a tree by the bank of a stream holds that bank in place, provides a wind break for a house or garden, shades and filters sunlight for plants under its canopy, prevents water runoff during the rainy season and prevents water evaporation during the heat of summer — all while purifying the air and producing the oxygen we breathe. Three deciduous trees strategically planted around our house will keep it cool in summer and warmer in winter, saving up to 50 per cent on energy bills. 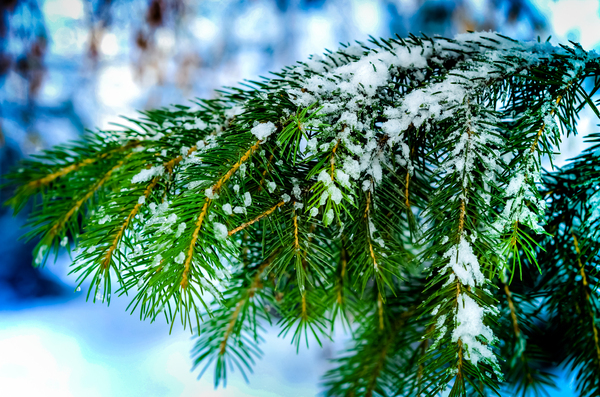 An evergreen provides beauty during the dreariest times of year and habitat for nesting birds and countless other flora and fauna. 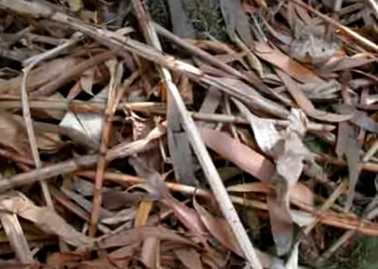 A forest floor is one of the most nutritious places on earth with the interaction between fallen leaves and the multitude of micro-organisms rebuilding soil at the expeditious rate of about one inch per every thousand years. 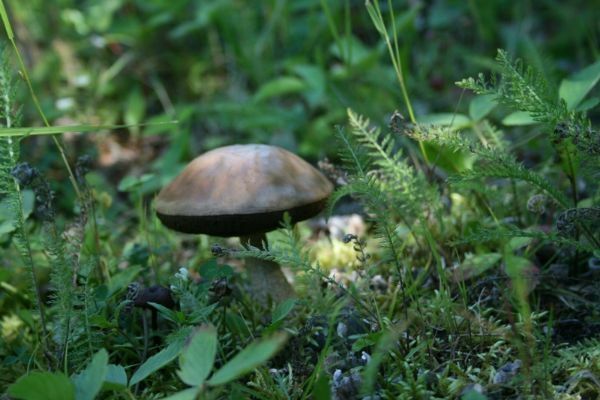 Nearly every modern drug known to man can trace its origins from the forest, a plant or an herb. In short, nature is by nature complex, ever coordinating in amazing harmony its broad circle of countless undertakings, an ability that took multi-millions of years to hone into the infinite life forms we now take for granted. What could it mean, then, to stack functions with a horse? We tend to think of training in a linear fashion. 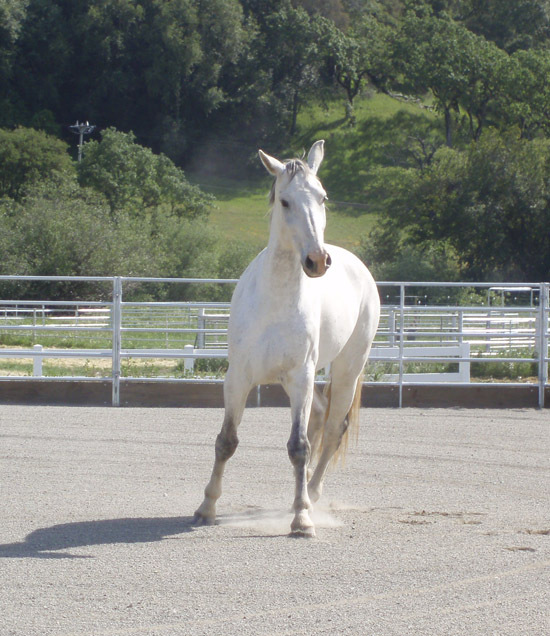 A horse is “well-trained” when it can run through a set of gaits, movements or actions developed one after another. Yet how odd to see a Grand Prix jumper leap a six-foot wall but spook at a flapping handkerchief. 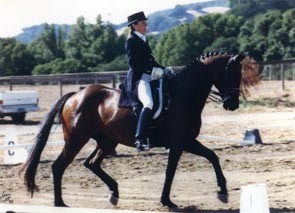 Or a Grand Prix dressage “master” execute a perfect piaffe but refuse to load into a trailer. What causes a horse to carry us over the most difficult terrain yet walk away when they see us approaching the stall door or paddock gate? Why will they make themselves uncomfortable or prematurely lame performing collected movements before developing the muscle to do so, yet throw their head out of reach when we attempt to bridle? 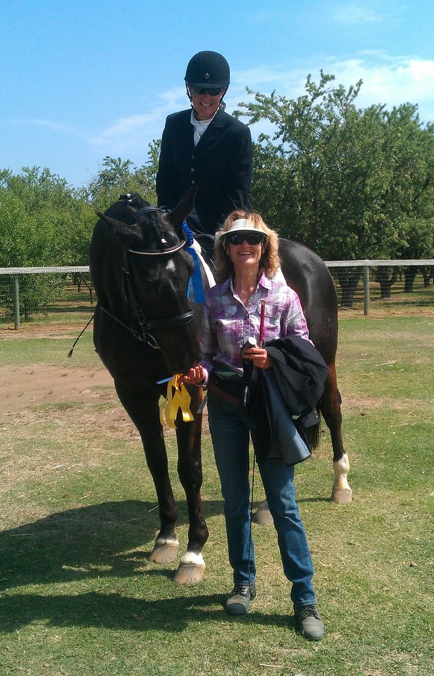 On the flip side of the same coin, it is not uncommon for me to attend a show with a student who has spent the last several years re-schooling their horse and hear the comment, “My, that horse is so well-behaved. What breed is he?” as if they might decide to place an order for just that make and model. Ah yes, I smile in return, it must be the breed because who would be willing to put in the time and effort to do what so many horse owners don’t realize can be done in the first place? Perhaps the better question is: how do we incorporate a multi-layered approach into our “training” program to ensure the quality of the relationship as well as the quantity of tasks we are trying to achieve? In the same way that working with nature rather than against it requires us to learn something about nature and our relationship to it, so does working with a horse in a more-than-superficial way. Learning about the nature of the horse informs us of how best to interact with them in order to ensure they would rather be with us than anywhere else. One example of this presented itself earlier this year when I was working with a student at Denise Lesnik’s Inside Out Horse Training in Elgin, IL. 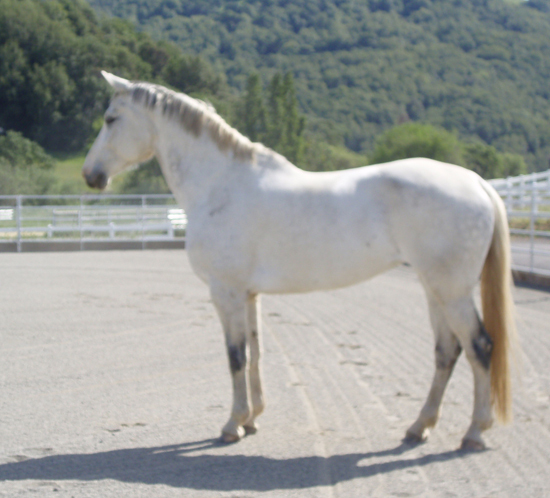 Every time his horse passed by the open gate to the indoor arena his mare spooked. The contrasting light of the outdoors to the darker shadows of the indoor caught her off guard every time, and everything he was working on — her softness, head carriage, and calm walk (you know, the important stuff of “training”) — evaporated into a big spook. 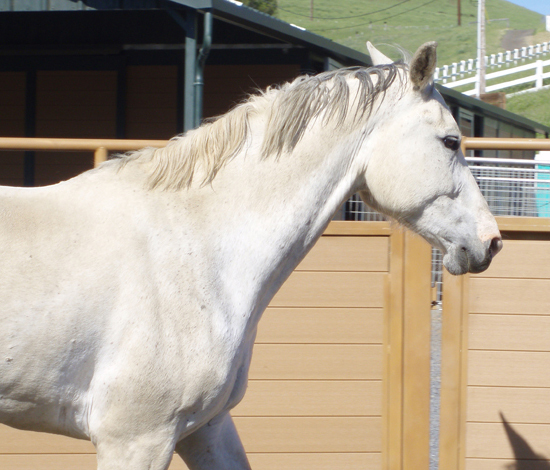 Flexing to the outside while riding past the gate allows Toshi to assess her environment while keeping her soft and responsive to her rider. nonsense. Instead of fighting them for their attention, we have another option. Flexing their heads to the outside or toward what they’re spooking at works the same way as a flexion to the inside by breaking up the tension in their jaw, neck and shoulders. In this way we can direct them to soften to the rein and stay with us while at the same time allowing them to look at whatever is causing them to spook. If we do this while in motion, we elicit a response from them while respecting their needs as well. Then we haven’t actually allowed the situation to control our ride after all, but made it possible for them to stay connected to us while meeting their own desire for self-preservation. “But my horse isn’t really scared. He’s just spooking to avoid having to work,” you might argue. 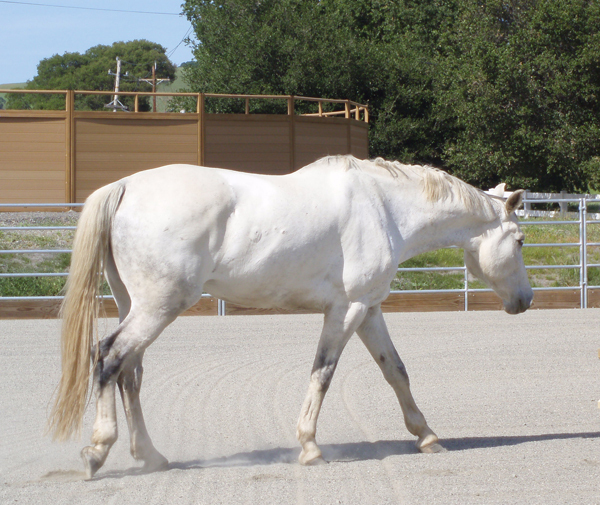 Crossing the hind legs unlocks the hip joint and stretches the adductors and abductors, breaking up our horse’s brace and making them more responsive and maneuverable. As softness is achieved, relaxation can ensue. Yet the remedy is the same. 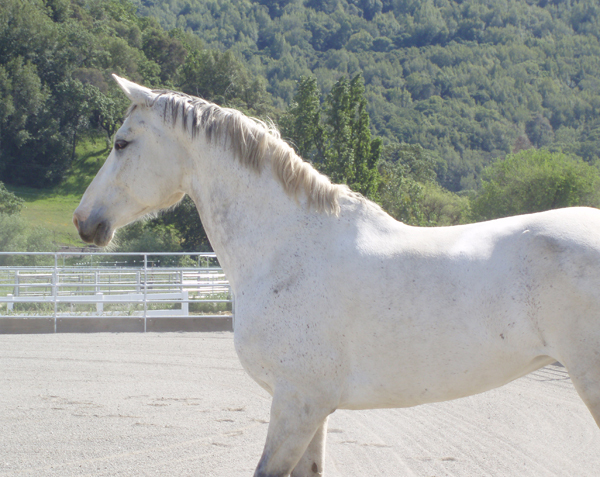 Think about why your horse is trying to avoid working for you or paying attention to you. A horse likes or dislikes what they’re being asked to do because of their association with it. If they don’t see you as a leader worthy of their effort to override those associations, they’ll resent having to comply with you. The counter-flexion is one way of establishing or reestablishing your leadership in this kind of circumstance. 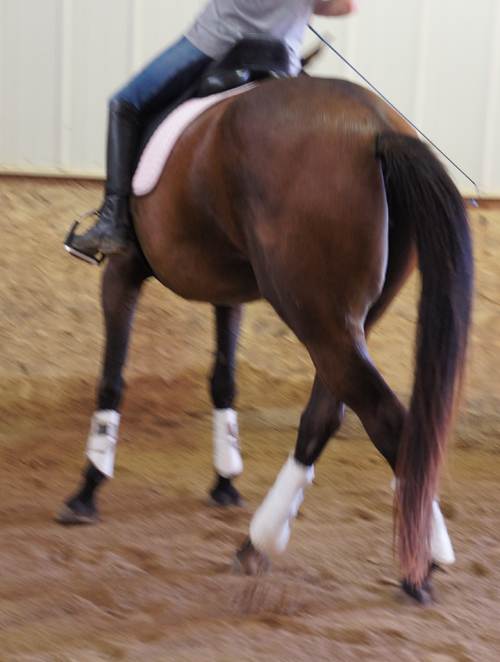 Letting our horse stand and look may or may not be helpful. Sometimes it calms them right down. Other times, the lack of movement bottles up their tension. In that case, keep them moving. The movement acts like a valve on a pressure cooker, letting the steam out to prevent an explosion. purpose: 1) it will un-stick the hindquarters and break up bracing through their whole body, helping them become easier for you to maneuver, and 2) as the brace dissolves, softness takes its place. Getting that softness is key to getting them to relax and let down, thereby helping them create a new association with the troubled spot. If your horse’s reaction is still too intense for your ability to manage, allow him to move farther away from the epicenter until he quiets enough for you to move in closer again. That may take a few minutes or a few days. 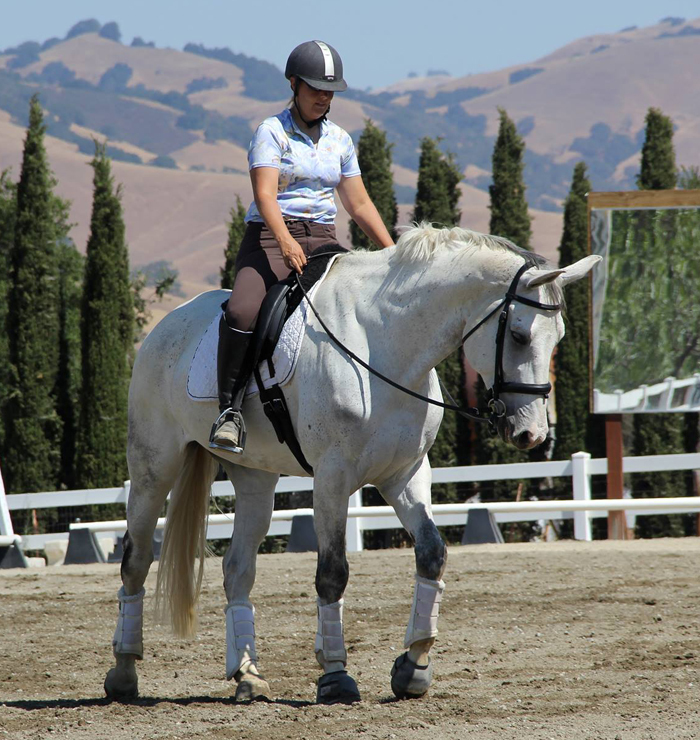 But as you achieve even small successes, the situation that initially caused you to think it had ruined your ride suddenly becomes a training exercise to help your horse become more supple, athletic and attentive. 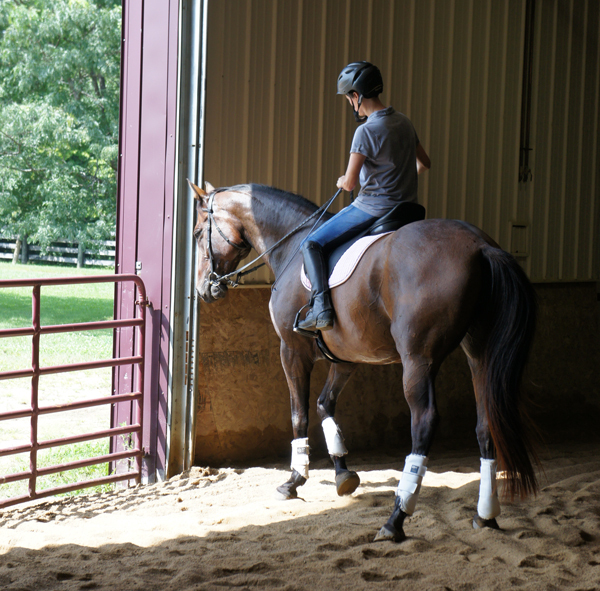 You may find that it helps your leg-yields along with your horse’s ability to keep his head in scary situations because he has learned to have confidence in your direction. 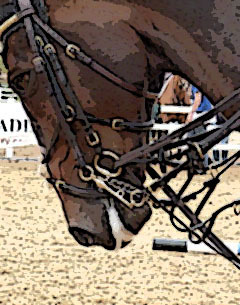 You have now used every aspect of an unwanted situation to you and your horse’s benefit. Stacking functions indeed! 11. Make the least change for the greatest effect. How does one take a dangerous horse and bring out it’s “good nature” in the most efficient way possible without putting oneself at risk? This is the first question I asked myself when I began working with Zoe. As a trainer, I had already been down the road of coercing my horses to do my bidding, using side-reins and draw-reins and French reins and German reins and flash nose-bands and strong bits and roweled spurs and all the usual (and legal) paraphernalia. I knew how much work it was to punish bad behavior, contain rebellion and demand a work ethic that would grant me the success of my personal ambitions. But in the end, working harder had not saved me from ruining a really great horse, and making the lives of my others-in-training pretty stressful. We take the simple acts of haltering and bridling for granted. 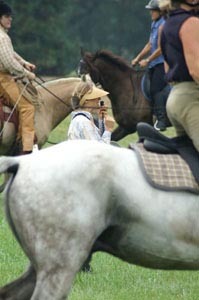 But I’ve seen few people other than Tom take such care to ensure the horse will be completely at ease with the process. The beautiful thing about Tom was that there was never any blame attached to his quips. 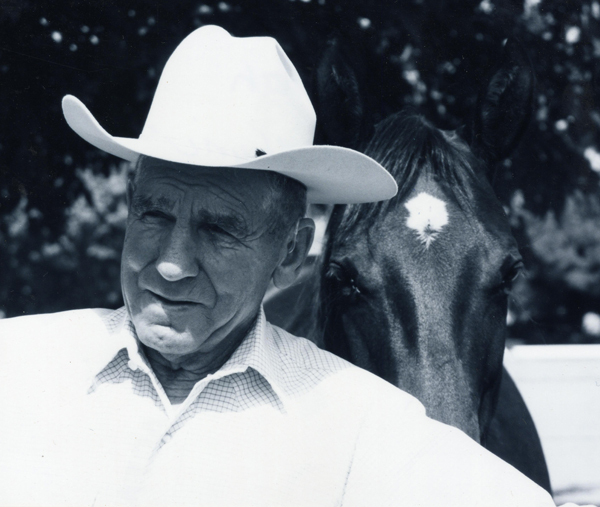 He gave both horses and people all the time they needed to come up with a better strategy than the one currently causing their life misery, and without censure. Of course in my case, I already had a well-developed inner-flogger who found fault with everything I did, so it was life-changing, to say the least, to be granted a different perspective of myself through Tom’s eyes. He never lost his temper nor gave up on me no matter how many mistakes I made or how many times I repeated them. Likewise, the horse was given the means to work out their own “troubled spots,” Tom stepping in to “support and direct” only sparingly. “I’m just trying to keep them this side of trouble,” he would say, allowing them to wander pretty close to the edge so that they could learn to make a better decision for themselves. Translated, that meant helping a horse learn to behave in ways that made their life easier amid the world of humans. This included giving them an opportunity to be relaxed, 1) inside their own skin, 2) with their surroundings, and 3) with the person. Relaxation in these three areas constitutes the most significant change we can make each day in order to establish a reliable foundation upon which everything else rests. 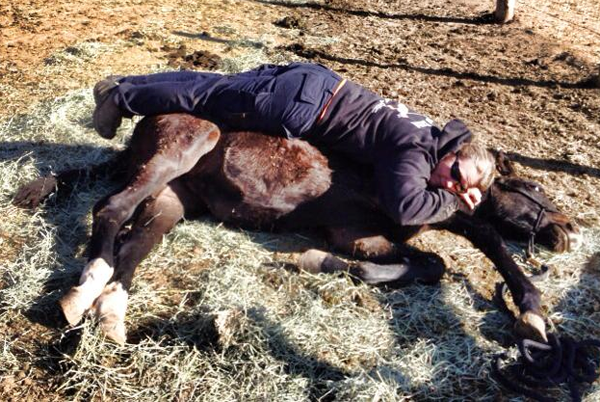 No matter how hard we try, we cannot make our horse relax. It is an ability that everyone — horses and people — must learn for themselves. We can, however, set up the conditions within which they more easily and readily learn how to do just that. Oftentimes, the best way is by letting them loose. 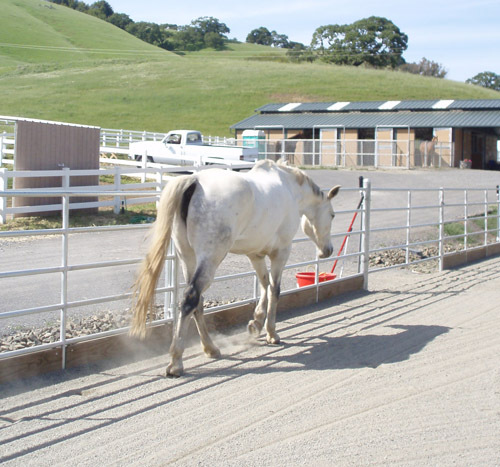 When our horse is loose inside a round pen or an arena, the fence line or wall creates a definite boundary, but within that boundary, they have complete freedom to make whatever decision they choose, and then to learn the consequences of that decision. With Zoe, for example, that was key. When she was turned loose for the first time, everything scared her. She thought she needed to run away, so she ran. But for the first time, no one rushed in to try to stop her or “bring her under control.” The fence line did the work that a halter and lead would have otherwise done to keep her in proximity, but without me having to strain to keep her in check. that one simple directive. As she walked, she could look around and check out her world more thoroughly. 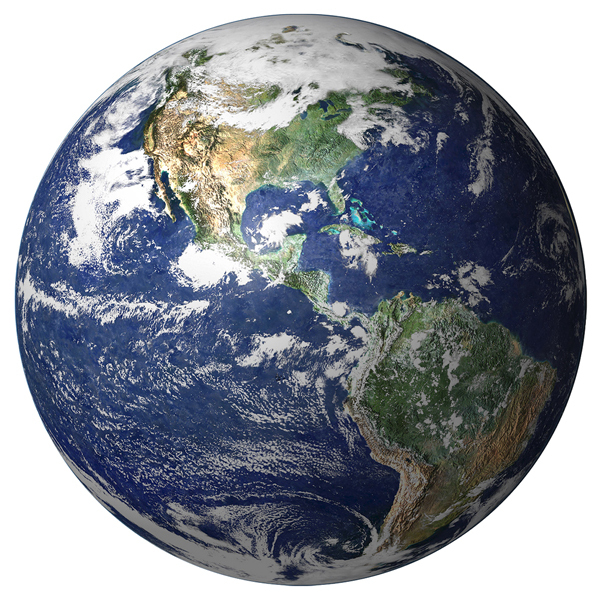 That world — including the people and things in it — became less and less suspect. Over time, fear morphed into curiosity, and curiosity into play. Learning to relax was the fundamental change that made her life better, but mine, too. Of course she became easier to work with, but was simply more pleasant to be around as well. Where once she wouldn’t put herself within arm’s reach, “hanging out” with her peeps has now become one of her favorite pastimes. Allowing Zoe time to learn to relax required having some understanding of a horse’s nature in order to know what scenarios might aid her in working through her own issues. It also required letting go of blaming her for being crazy or too freakish to handle. Labeling her as such had not done one bit to help her become “sensible.” In addition, letting her learn rather than forcing her to comply was a lot more fun and rewarding for me than loading her up with draw reins and gag bits just to keep her feet on the ground. Continuing as Zoe’s advocate means continuing to learn about her as she moves through the various stages of reaching her potential. In the one and a half years of working with her, it has not been a straight and uphill path. It’s been just like life, circuitous and surprising and well worth the journey. 1o. Pollution is an unused resource. Feces from every source is usually considered such a substance. In other words, if we were to eat it directly, we would probably get very sick. However, that same substance, composted properly, produces rich and nutritious fertilizer for a garden; even clean energy for a house. (See: “Cow Power” and “Humanure”) So, is it more efficient to cart it “away” (or flush it down the toilet), and then buy chemical fertilizers that strip the soil of biodiversity before leaching into our rivers? Rivers flow to the ocean, along with chemicals from said fertilizers and pesticides, creating dead zones thousands of square miles wide — such as the one off our very own Gulf coast (See: Gulf of Mexico Dead Zone) — costing much more to be cleaned up and remedied after the fact. 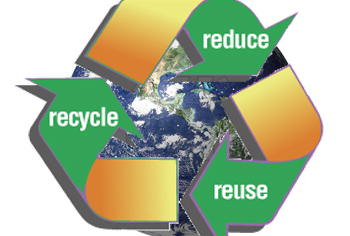 So… Is it more efficient to plan ahead, and have a way to reuse such waste in a way that is beneficial to us and those around us? Carting “away” and flushing is a quick way to rid ourselves of what we don’t want to deal with. It does not require us to think about the consequences of our actions. The only thing is, because the Earth is a closed-loop system, there really is no “away.” Pollution is merely deferred or shows up somewhere else, eventually. But because that can take some time, we are usually caught unawares and made to question ourselves only when our own ground water has become too contaminated to drink or our beaches unsafe to swim in. The latter approach, on the other hand, requires us to think first before taking action. It’s slow going in the beginning because we have to conceptualize a consequential chain of events that might occur down the road before we even get there. This is time consuming, requiring patience and a willingness to educate ourselves on the nature of the substance we’re dealing with, what it will take to recycle or reuse it so that it is rendered harmless to ourselves and to others, and what infrastructure needs to be in place to accommodate that process. It also means that we have acquired the maturity to take responsibility for our role in generating waste, rather than leaving it for someone else to clean up. 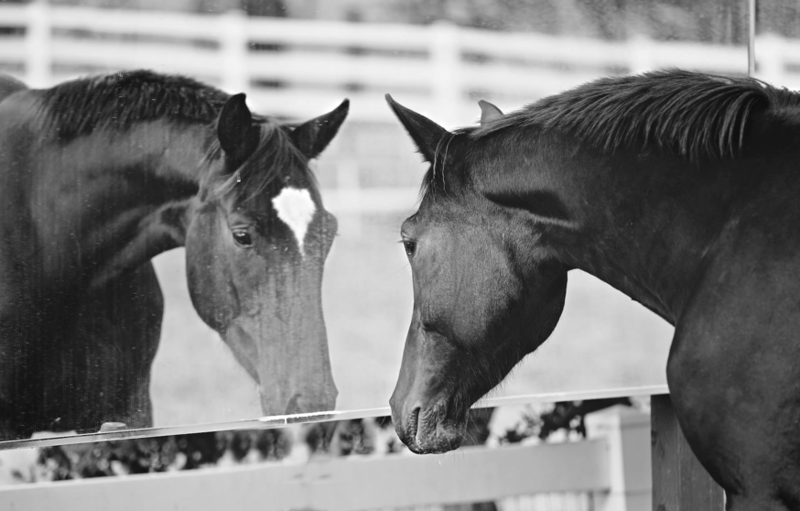 Likewise — and for the more immediate sake of our equine partners — something similar occurs when we define “pollution” as our horse’s “bad behavior.” Just like feces, we want to get rid of it — to make it go “away.” But here’s the rub: bad behavior is, most of the time, the unwanted result of interaction with humans, that closed-loop relationship between us and them. That doesn’t mean that the interaction was intentionally abusive. 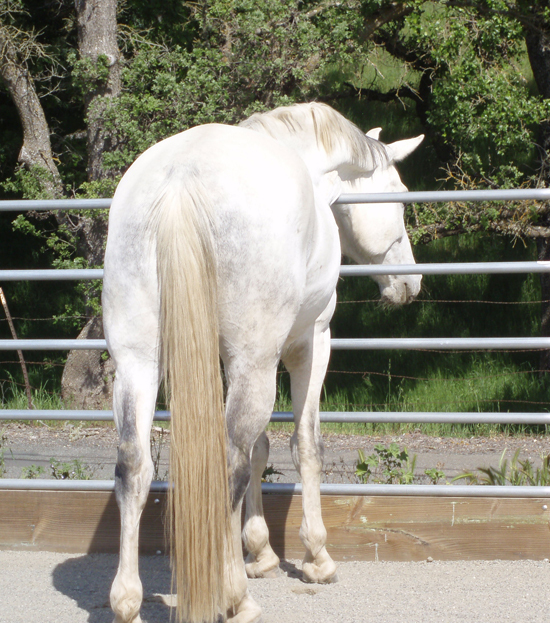 Sometimes we are just not experienced enough to know how to deal with our horse’s natural tendencies, or we are met with an unplanned occurrence that overwhelms our ability to cope. Other times we acquire a horse who has been misrepresented. They seem fine when we try them out, but once at home, everything we don’t want in their personality comes up in our face. There are many methods of training and re-schooling. The choices we find closest to us and most affordable are usually the ones we opt for. A typical approach is to use techniques that stifle unwanted behavior or that attempt to retrain the bad behavior “away.” It’s usually the quickest way to deal with a problem up front, like the approach initially taken with Zoe, the subject of our previous blog entry. But if the method employed keeps our horse in line by coercion, we will find that either the behavior gets worse or that our horse simply shuts down, becoming responsive only in very mechanical ways. For those of us who are adept at putting on a thick skin and ignoring our horse’s displeasure, this may seem the best solution. But, as usual, there is another way to interpret our situation. What if we’ve already been down the road described in the previous paragraph and found that our horse’s unhappiness is actually painful to us? And what if, as in Zoe’s case, the attempts to train our highly gifted horse merely causes them to fight back harder and become more dangerous than before? Then we become motivated to seek an alternative and prepare ourselves to participate in the “clean-up” rather than covering it up or deferring it entirely. We set ourselves on the path of becoming better educated about our horse, what motivates them and how we might intervene on their behalf, thus repositioning ourselves as their advocate rather than their adversary. This does not mean that we now have to do everything ourselves, but because the lens through which we are assessing our horse and their world has changed significantly, who we seek out for help will change too. We will be interviewing potential trainers or handlers with more discernment, watching to see if they are genuinely interested in our horse’s welfare rather than in stoking their own egos or doing things for our horse the way they do with every other horse. 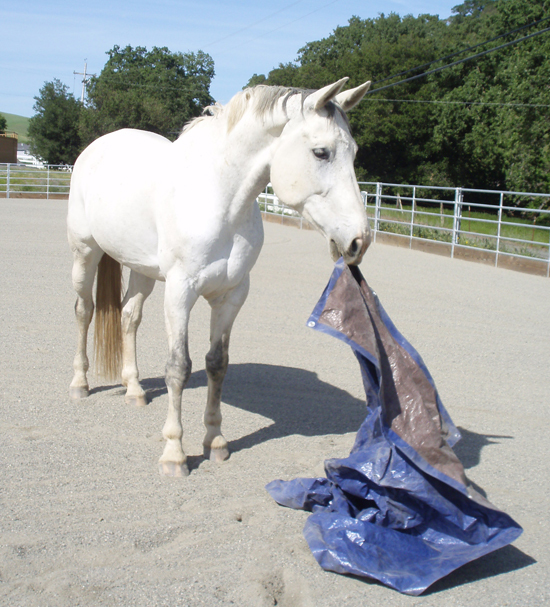 We will be trying to assess whether their decisions and actions support the emergence of our horse’s underlying good nature (and yes, your horse does have one) rather than masking over the problem with a new technique, a new trick or a new piece of equipment, just to keep everything in check. It’s spending time up front, and it will initially seem to take longer, but after traveling down both roads, the phrase “slow is fast” becomes ever clearer and true. Tune in next time for more of Zoe’s progress! 9. In the problem lies the solution. I knew very little about Zoe when I saw her for the first time, but her owner, Romy, had told me that no one except her groom could take her out of her paddock, that she didn’t like to be touched, and that she was dangerous to ride. 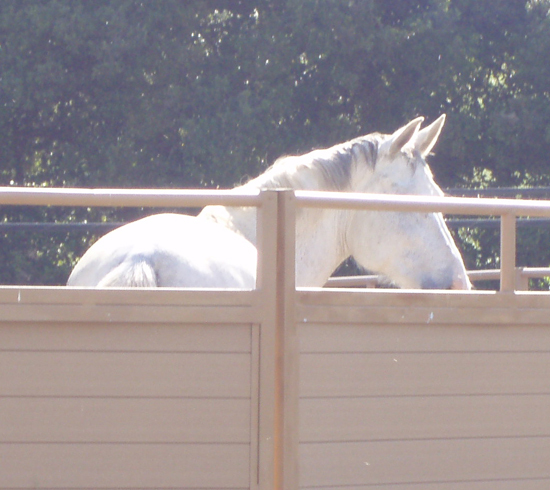 The fact that she would not budge from the horse trailer upon arriving, and then, after some coaxing, could not be safely lead from the trailer to the large round pen by her owner indicated extreme tension. It took me quite a while to hand-walk her the short distance to the round pen using a long, 15-foot lead rope. I am familiar with using a rope for the purpose of keeping a horse at some distance behind me and did so with Zoe so that she would remain out of striking and kicking range. My 120 lbs was not enough to contain the 2000 lb, 18-hand mare from leaping, bolting and rearing, but with the rope I could set a parameter so that she wouldn’t harm me when her feet left the ground. As we remained outside the pen to observe, I began to search Zoe’s demeanor for more clues. First, in spite of the tension that was coursing through her entire being, she was not running herself into the fence, into the ground, or anywhere accept in fits and starts within the pen. It takes some presence of mind to respect such parameters while under the influence of so much turmoil. This allowed me to question the label of “insane mare” that she came with. Unfortunately, I did not have a camera with me that first day and these photos, taken more recently, do not reflect the degree of tension I describe. 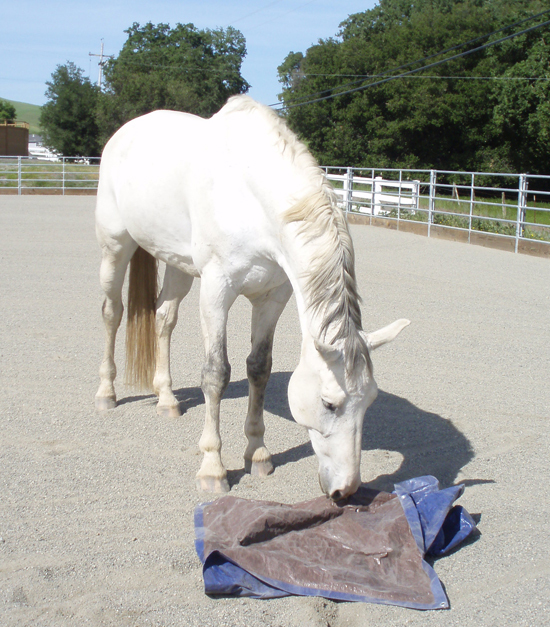 However, they do reflect a now-manageable horse who has some residual tension and that “need to look,” more common among horses we experience everyday. For this reason I’m including them here because the process of helping a horse at this stage remains the same. Secondly, Zoe definitely wanted to look, and rushed to and fro to then stop and gaze at everything between bolts. Maybe it’s that we forget what it’s like to be a child, needing to explore all that lies around us. Or maybe it’s just that we’ve heard the phrase, “get that horse to pay attention to you,” for so long that we have lost the ability to appreciate one of life’s natural functions at work: the gift of raw awareness, an “on-site resource” that allows us — both horses and people — to process and interpret the meaning of the world around us, and to do so to the point where we are settled, or confident, with our place in it. 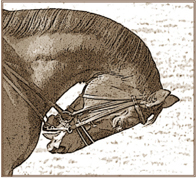 Thirdly, the tensions that Zoe exhibited — head and neck pariscoping, back hollow, tail high and arched, body rigid — were typical of any horse filled with fear and insecurity. For a person to step in at this point to get a response would have been asking for disappointment, a fight, an escalation of reactivity, or all of the above. She was not yet capable of freeing her mind from trying to figure out where she was, to then also respond to the requirements of a human. After a while, however, her sudden bursts of movement began to include sniffing the ground, the rail, the wind. With each lowering of her head the muscles in her body could release some modicum of tension, even if only for a few seconds at a time. Her prance and dart from one side of the round pen to the other eased into a sporadic trot and even an occasional walk. By this time, she had still not looked our way, nor seemed to care about our human presence… oh, but wait… there was that little twitch of an ear, cocked in our direction for a few nanoseconds now and again. It’s something that’s easy to miss, but it reflected the fact that she was aware of us. Zoe performing a “drive-by.” Sure seems like she’s blowing me off… but wait… what’s up with that right ear? At this point, I had Romy move inside the pen and wait in the middle. Although Zoe still appeared transfixed with all that was happening around her, she would often arc in close to Romy on her way from one side of the pen to the other. For many people, this behavior is particularly annoying. The horse seems like it’s finally coming in to acknowledge you, but then turns and moves off like you never existed. But there’s another way to interpret it. Just as a child who is barely old enough to be aware of the world outside its mother wanders off before coming back in for reassurance, so will a horse come close before their inherent need to assess their world pulls them out again to gaze at their surroundings. A “drive-by,” I call it, indicating that there was something positive Zoe received by veering close to her person before going back out toward the rail to look away some more. What were we supposed to do about that? Nothing. Zoe’s inherent processes were already busy at work, helping her to bit by bit calm and settle herself. That was a lesson no one would be able to make her learn. But by staying out of her way, we could give her the opportunity to learn it for herself. In other words, we were using her wandering attention, normally considered a liability, to our benefit, and for the benefit of Zoe as well. In the problem lies the solution. What I like about the term “optimize yields” is that it at first hooks us in to our usual way of looking at things, luring us into thinking we’ll need to get very busy producing a lot of stuff. When working with horses, that gets translated into fixing all the things that aren’t working while training them up to do all the “stuff” we’d like them to do. But even though working with horses requires energy, active participation, and oftentimes strength, stamina and fortitude, these qualities do not require coercion and strain in order to manipulate outcomes and have things go our way. The same is true about growing a garden. Geoff Lawton has become famous for his understanding of natural systems, so when asked to design and grow a garden in one of the hottest and driest places on earth, he didn’t hesitate. 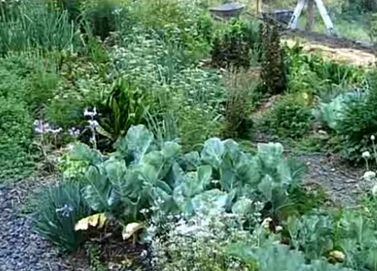 In fact, you can see how he did it in this short 5-minute video, an example of how a seeming wasteland can transform into an amazing food forest without the use of fertilizers, pesticides or, for that matter, much water. You’ll see that he spends little time worrying or complaining about what isn’t available or what isn’t working, he just gets busy assessing what will allow for success, and then puts that into practice. The beds where trees are born. If you watch the video closely, you will see that everything that requires action has first been studied and considered. Second, Lawton works with natural systems rather than spending unnecessary energy superimposing uncomplimentary landscapes with no regard for what is already there. Thirdly, the area is appreciated for what can be garnered on site. The effort needed for production is spent on “creating conditions conducive to life.” What follows next is a stepping back, if you will, to allow life to do what it does best. Thrive! The fruits of one’s efficiency. In other words, this approach is not based on exploiting productivity — even though the need to eat makes productivity just as important as ever — but from observing life’s generative nature. A willingness to take time for this kind of observation (#1 on our list of permaculture principles), and then applying the knowledge we gain from doing so is what develops skill. If we don’t operate from this basis, we will feel compelled to band-aid outcomes, compensating for our ignorance about how nature actually works. The same thing could be said about working with horses. We are all taught to fix what is broken, so when we find ourselves getting bucked off, run away with, or trying to manage a rear, a spook, balking, pawing, excessive whinnying, a duck-and-run, separation anxiety, general unresponsiveness or simple tension of any kind, most of us tend to think of the equipment we can use or what technique or method we can impose in order to “train” our horse not to express that undesirable behavior — until we’ve eliminated everything that frightens, irritates or in some way displeases us. 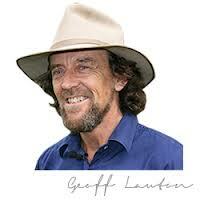 But what if we knew enough about the horse to trust their own inherent nature to solve the problem for us? 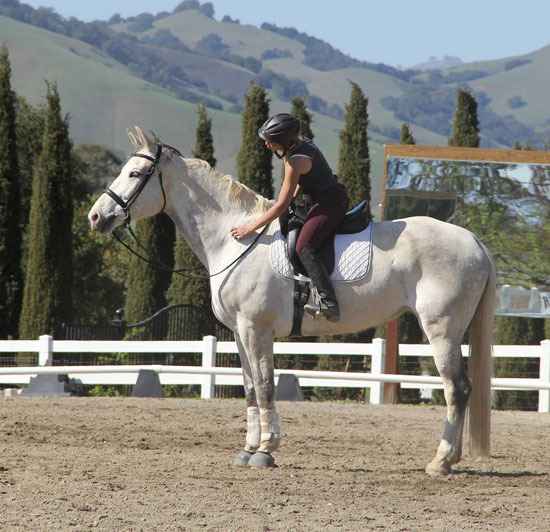 A consideration for the horse is vital to understanding their perspectives, goals, and reference points, as well as their innate ability to think and feel for themselves. This does not mean that we sit back and do nothing. It does means that we need to be a lot better educated about our horses and what motivates, concerns and interests them. It also means we will need to put a lot more thought into what it is we are doing and why we are doing it. If we do this first, what we decide to act upon can be done without (or with less) strain, worry, fear, anger, or impatience. 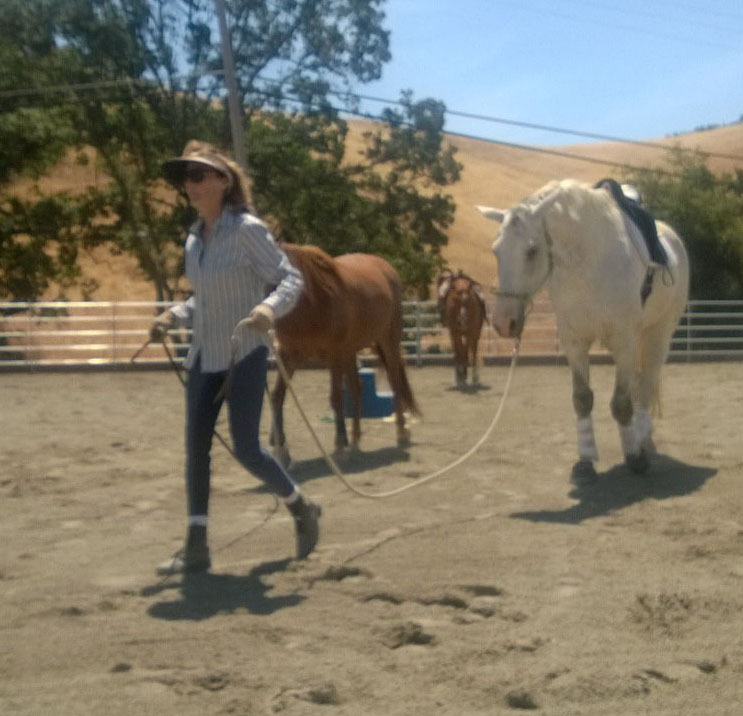 Denise Lesnik, owner of Inside-Out Horse Training, is working with Zoe for the first time at the Monkey Tail Ranch in Hollister, CA. (P.S. Note what “working” often entails as Zoe accepts a rub on the rump). to understand why the people she was entrusted to for a time resorted to a range of equipment and punishment in an effort to get the upper hand. Their attempt was to set boundaries on her movements, coercing her to submit and thereby rendering her manageable. But true to any good alpha horse, she merely rebelled. Motivated by fear and anger, she developed herself as her own unique model of a ticking time bomb, and explode she did! Deemed mentally unsound and pronounced too dangerous to ride or handle, the owner was forced to consider euthanasia. What would you do with a horse who was either too scared to pay a mere human any mind or too pissed off to try? It’s good to be back at the blog after a rather lengthy hiatus. 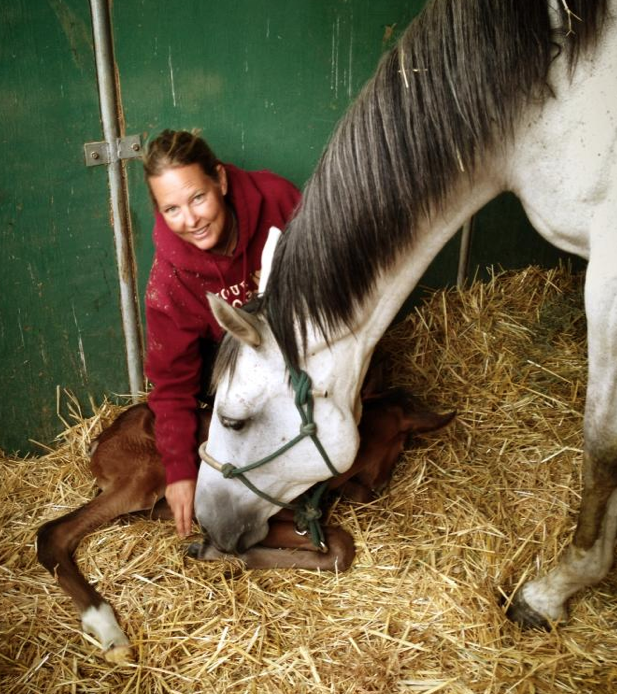 Writing helps me clarify what I think and feel about horses and so, too, about life. But it’s one thing to think about ideas and to expound on them. No time or space is required. It’s another thing to put those same ideas into practice. Working in the dimension of time and space allows us to do just that. because that horse was not in a place of my preference. He was in the place where he was. I was not going to be able to move forward until I “came to” him and acknowledged that place, no matter how disappointing that felt. The place I thought he should be seemed much better, and I could justify why I was right! But the face of time and space often mirror a different set of circumstances. I had to (finally) take note of them, otherwise I would be trying to get from him what he was not prepared to give. So how does one go about bringing a horse from where they are to where we’d like them to be, and do that without being forceful, intimidating, insensitive, coercive, or threatening? Right. And what does that mean? 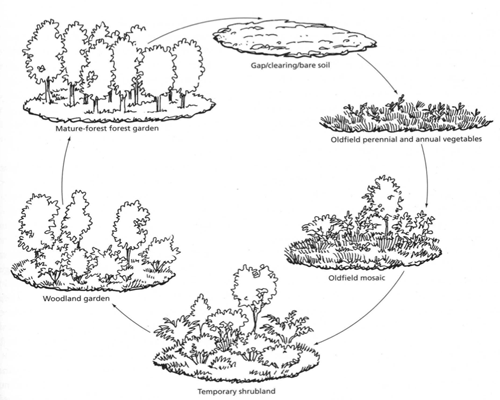 In the field of biology, ecotone or edge means “a region of transition between two biological communities.” In natural settings, the space between field and forest or pond and hillside attract a great variety and density of plants and animals along with high productivity. In human settings, however, the transition from woods to field tends to be more abrupt, giving it what we often interpret as a “clean” look — neat and tidy. 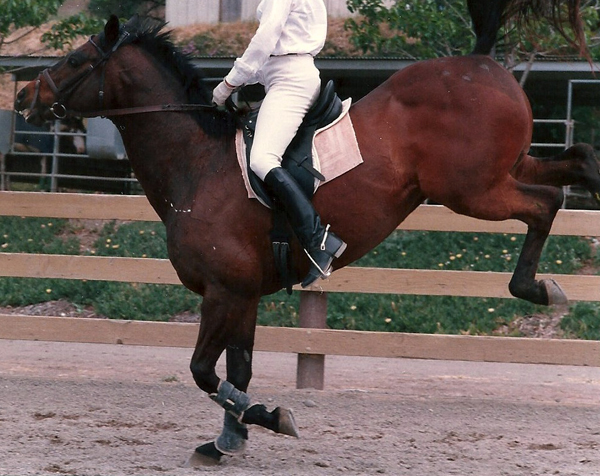 It’s the way most of us learned to make transitions on a horse. 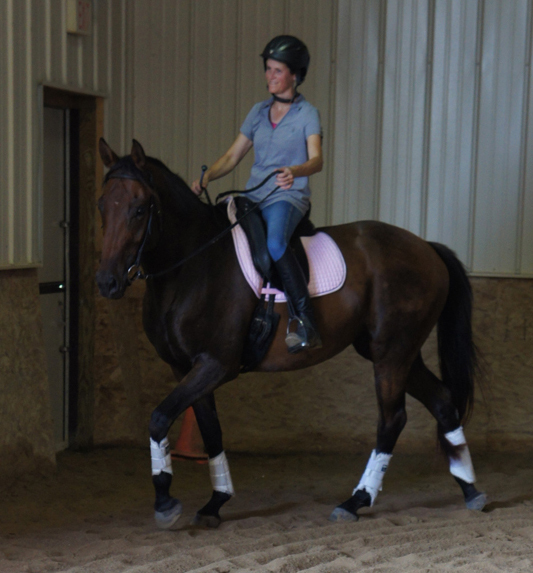 We want the trot to spring suddenly out of a walk and the canter to come suddenly out of a trot without noting if our horses were stiff, tight, or backed-off to begin with. 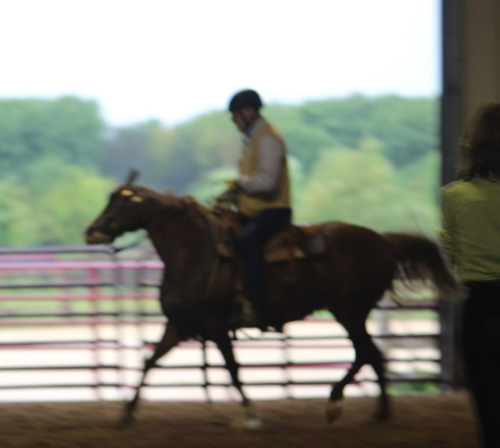 Do we ever consider what it took our horse to prepare itself to go from one gait to the next or whether the transition was smooth, well coordinated, or strained in order to comply with our demand? Do we know if our horse’s movement came anywhere near their potential for athleticism, or whether it came out of habit, driven by a rote training regimen? 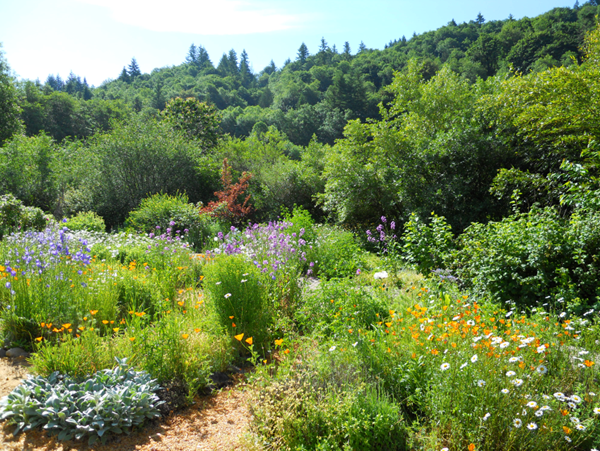 A layered and diverse garden “edge” for health, higher yields, and beauty. 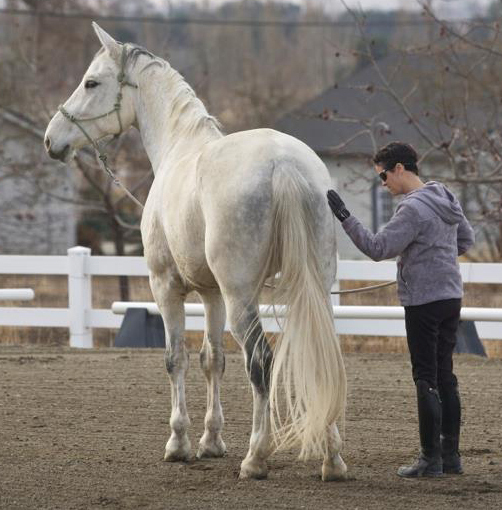 strength (the horse no longer needs to rely on strain to compensate for a weak muscle), thereby toning the body to maintain itself to a higher standard. 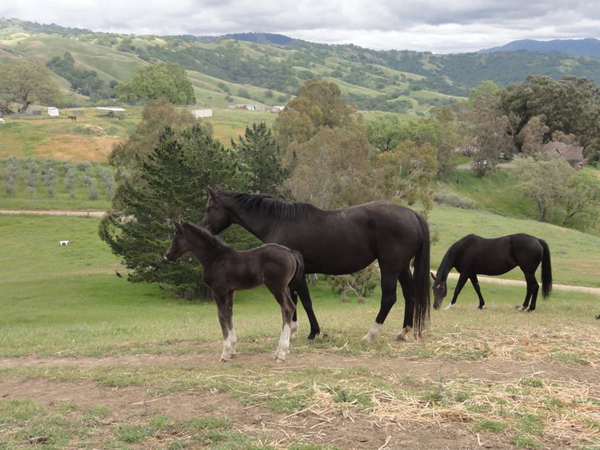 In both cases, the overall health of the ecosystem and the health of our horse is substantially improved. So… how can we change for the better? 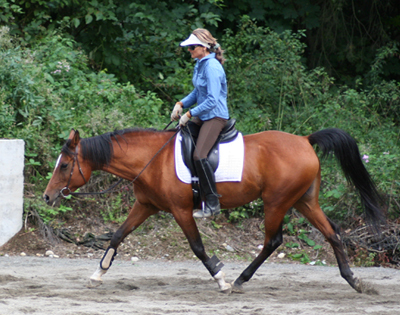 The effort in dressage to name specific differences in each gait: the collected walk, medium walk, extended, and free walk; the collected trot, working trot, lengthening at the trot, medium trot, extended trot, etc. has helped, but not produced many horses with true freedom of stride. While official terms serve as guidelines, I found out the hard way that they prepare us to compartmentalize a horse’s movement, when in reality a truly athletic transition has no boundaries. In other words, achieving a fluid stride means that each transition is seamless and unique, depending on time of day, footing, venue, surroundings, terrain, etc. I still laugh remembering the day I rode my troubled horse, “Blackie,” with Tom. 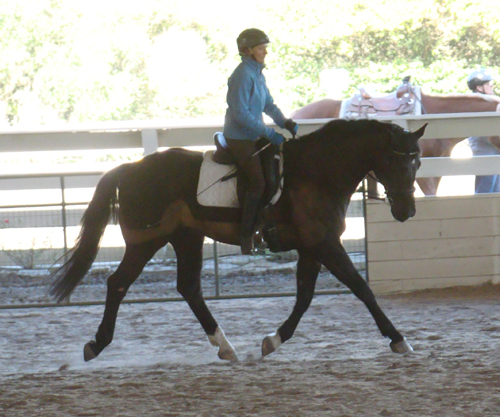 It took me about a year to figure out that he wasn’t looking for the “8” (a good score at a dressage show) transition to canter that I’d spent years honing. “Don’t try and do anything fancy,” he kept repeating until one day it occurred to me to just drop the reins and see what my horse would do if I encouraged him forward out of the trot. To my surprise, he dropped his head and lengthened his stride, the suspension between footfalls throwing my seat high out of the saddle with each attempt to post. He continued that way all the way down the long side of the pipe fencing surrounding the sand arena. As we came to the turn, he had to gather himself and voila! He delivered the smoothest transition to canter I’d ever felt. That simple action provided a contrast to the way I’d been riding up to that point, and that contrast was what made the light bulbs go off in my head. The transition was smooth, effortless, and all I’d had to do was let it happen. I never wanted to feel another contortion of that movement again. I thought the phrasing of these two points interesting. Most people assume that one must work in the dimensions of space and time — it’s the reality we live in, right? We get up, go through our day in some kind of sequence, encounter other objects and beings who appear solid just like us, then sleep — or not — and get up and do it all again the next day. So why take up two whole lines to mention the obvious? 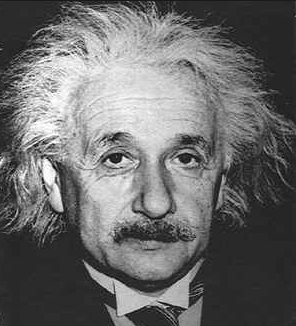 It’s as if the authors knew what Einstein knew when he said, “Time and space are not conditions in which we live, but modes by which we think,” acknowledging other dimensions of awareness. So… Is our reality not what it seems? And if so, why is it important to work in the dimensions of space and time? What does it mean for us in practical terms? Spatially, when we imagine a garden, most of us will picture it planted in the ground. It takes up a certain length and width, making up our plot. If we live in the suburbs with some kind of yard or in more rural areas with room to spare, we are not usually prompted to think beyond this conventional style of sowing a neat little row of one type of vegetable into the ground. But if we live in the city, does this mean we can’t grow a garden? 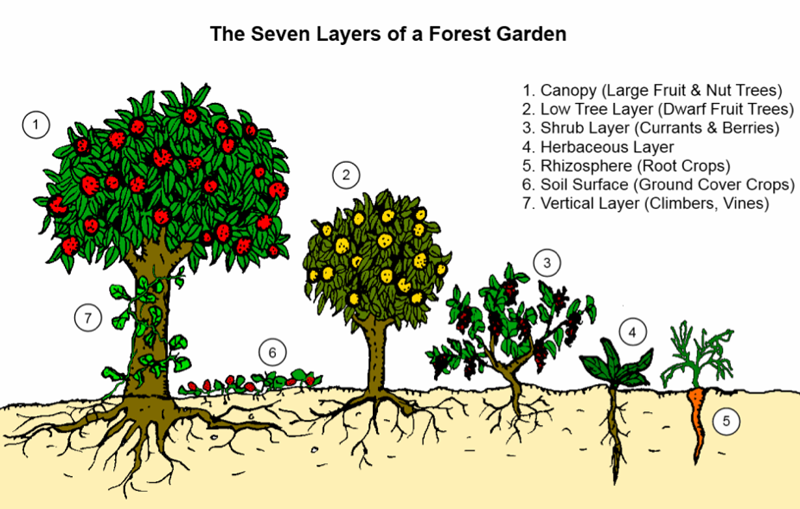 Seven commonly thought-of layers of a food forest. 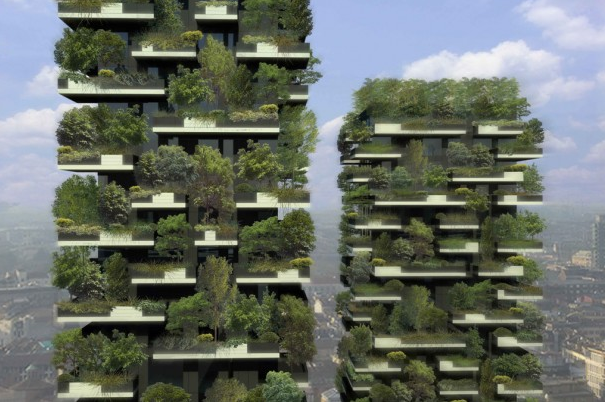 Urban buildings of the future? way of thinking. Thoughts are not solid nor do they take up space, yet we can add more and more of them to develop an expanded idea that becomes the catalyst for more appropriate action, design, or other modes of creation. 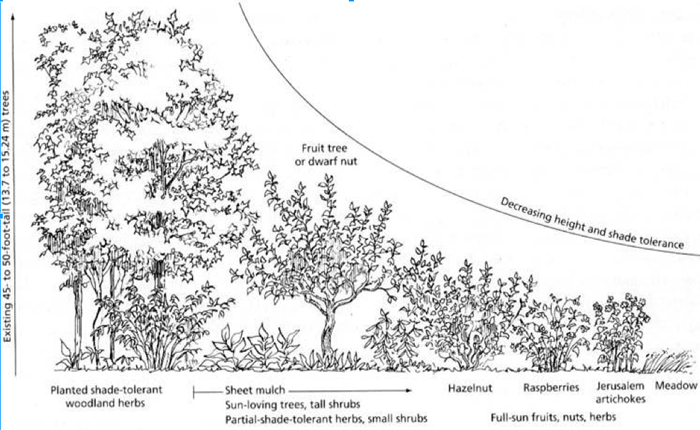 Beginning at the top right and moving clockwise, a clearing or bare soil provides space for perennials creating conditions for shrubs leading to woodlands before attaining the status of a mature forest. Working in the dimension of time can mean that we are aware of a succession of growth happening all around us, all the time. 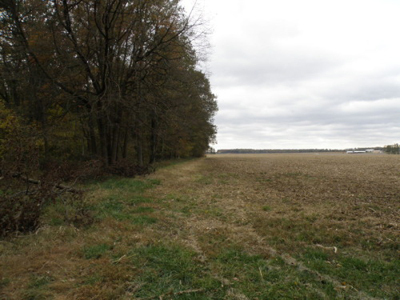 For example, if we were to observe an un-grazed, abandoned field over 50 to 100 years, we would see an inevitable transformation, illustrated in the diagram to the left. 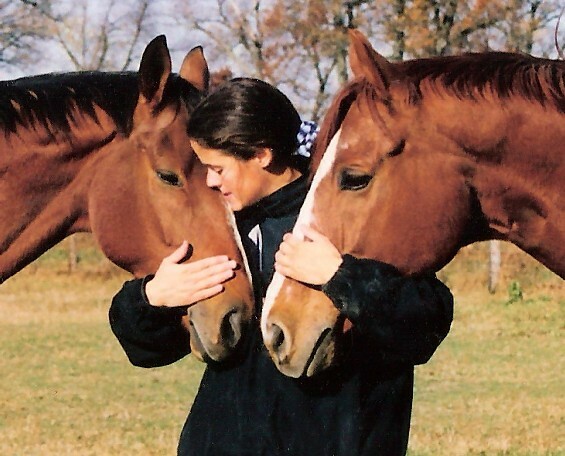 Okay, okay, okay… but remember, we’re horse people. What do all these plants have to do with horses? Well, I often find that using metaphors can be helpful. Sometimes we’ve become so acclimated to seeing what we think we know that we rely on what we’re familiar with, and not what is actually right in front of our nose. This happened to me recently. I was excited to be working once again with a Hanovarian gelding belonging to a friend and client of mine. 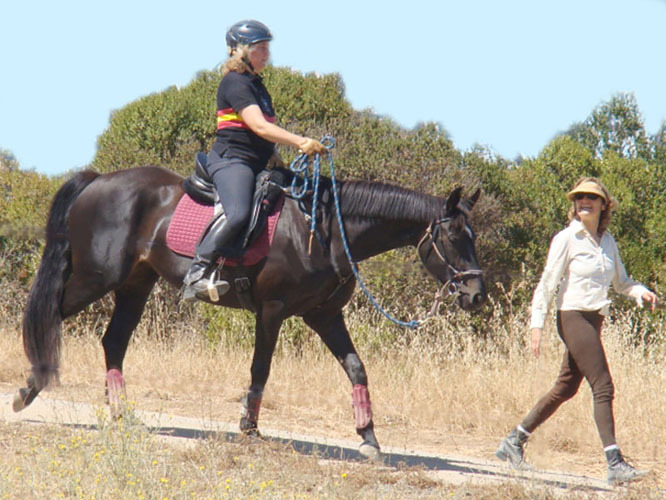 She and I have been working together for a number of years and have spent a lot of time re-schooling Robin, as he is called, out of tensions he developed by being pushed too hard too fast during his early years in training as a dressage horse. This past year, he has been doing exceptionally well. Reliably well, making great strides (pun intended) without strain, irritation or excitability. So when I got on him again for the first time in a month, I expected him to be butter in my hands. He was not butter in my hands. I began to do suppling exercises, and when he did not improve I became firmer, asking more poignantly, and when he still did not improve, I became firmer still. I mean, they were suppling exercises. What could be wrong with that? But at the end of the ride, I had a vague sense of being disappointed in myself. I quickly buried that thought and went home. The following day I did ground work, the uncomfortable taste of the prior day’s ride still in my mouth. He started out sticky, but ended well, so the next day I rode again. Again, he was not butter in my hands. At that point I had to admit that I had made an assumption of what he should feel like based on the last time I’d ridden him. In other words, I was living in the past. Then, when he turned out not to feel the way he had in the past, I began to push for him to feel better than he did in that moment. Now, I was living in the future. Because I could not achieve what I wanted in either dimension, I felt compelled to try harder to “fix” the “problem.” Now I was straining. Looking oneself in the mirror is often a good way to reflect. When I finally stopped to think, I recalled that the first night Robin arrived he had merely picked at his food. This horse is normally a voracious eater. 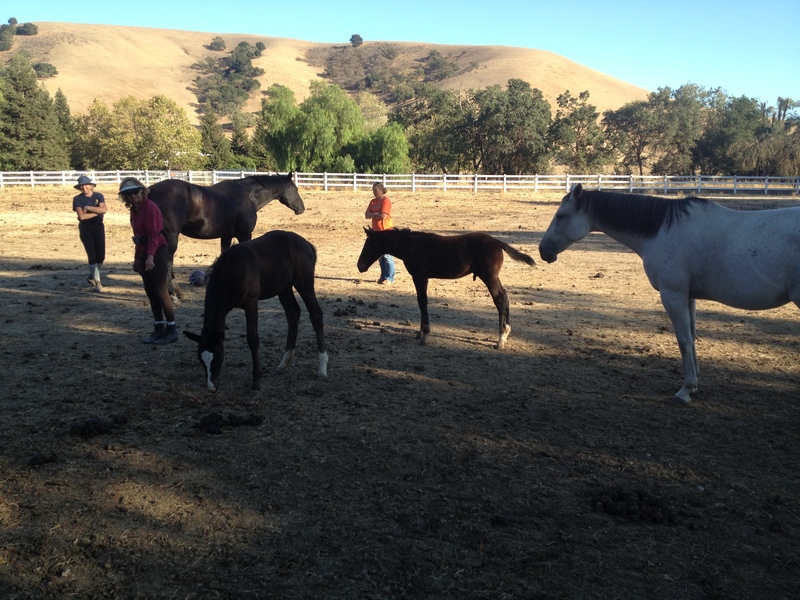 In addition, for the first 2 or 3 days, he had not engaged with the other horses in his pasture, also an anomaly. But he’d had no temperature, he was sound and moving with energy, and well, he was eating, albeit slowly. I dismounted, removed his tack, and continued to ruminate. It then occurred to me to palpate his back. There was no real “reason” to. He had been relaxed at the mounting block, did not react to the girth, my seat, or the saddle. Indeed, he was not sore over his withers or where the saddle sat. But when my hands glided into the muscles of his lower back and sacrum, he made a sudden dip with his hips, trying to get away from the pressure. He was sore. In the beginning, we usually know little about how things will turn out later on. It’s the nature of life, and gives us good reason to remain observant. Okay, but what did that mean? Again I had to accept the fact that, in that moment, I did not know the answer. But now it was clear to me that I could not proceed in the usual way until I found out. Because this was happening during the holidays, attempting to locate an available chiropractor or body worker was an impossibility. And so I was left to spend more than a week doing ground work and light riding only, noting the minute changes in his progressively favorable or unfavorable responses to me each day. This, interspersed with several conversations with his owner via telephone and email, allowed us to come up with an understanding of what his issues were and how to address them. Sometimes it’s surprising what we can get away with when we take the “time” to feel our way. Getting to this point took time, but in order to simply allow myself to observe what was happening, I had to abandon all concerns about time, about being held back, and about not being able to go some where. For me, time and space could not exist, else I’d place too much importance on them, thereby devaluing the depth of heart and spirit presenting itself as flesh and bone in each moment. At the same time, I had to observe the effects of my actions as they became apparent, using them to inform me of the appropriateness of my decisions. In short, I had to approach this horse with awareness and feeling, and let that be my guide through time and space.